Probably no need for it, but still... an introduction. 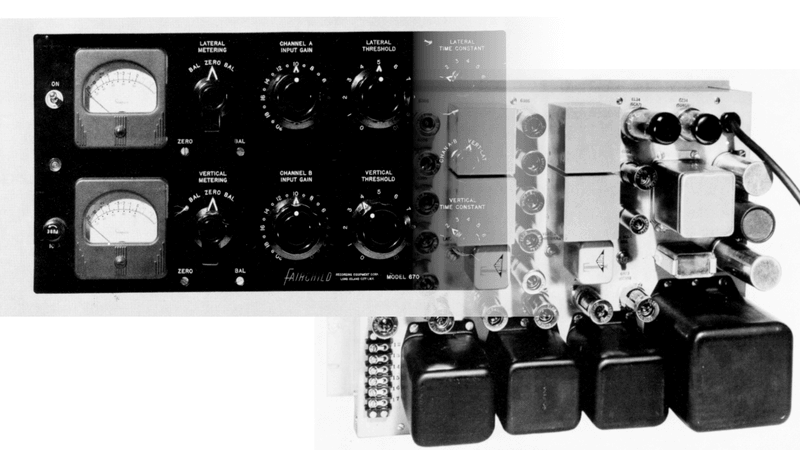 Unless you've been living under a rock, far away from human civilisation, and you've at least dabbled a bit in pro audio at some point in time, you must have heard about the famous Fairchild 670 Compressor/Limiter. It's by far no coincidence that this unit became so well known - the sound of it is simply in a league of its own. The Fairchild 660 (mono) and 670 (stereo) units were developed in the early 50' by Rein Narma and the 670 stereo variant was designed to be the last dynamics control stage before the vinyl cutting lathe. The Lateral/Vertical mode of operation directly corresponds to the movement of the needle and is today more commonly referred to as Mid/Side mode. At mix:analog, we are unfortunately not lucky enough to own a vintage unit (they can sell for more than 40.000€ today, IF you can find one for sale that is...), but we're proud we can offer you a recreation that's as close to the original as possible. No corners were cut. We followed the blueprint to a tee, the components used are either new-old-stock originals or tested and trusted replacements, used for original units' repair today. It weighs 35kgs (almost 80lbs!!) and it sounds awesome. But enough of the history and fun-facts, let's learn how to pilot that thing! Input gain is, to be technically correct, a passive attenuator placed before the main amplification stage. This gain stage is also where all the compression happens and with no gain reduction and INPUT GAIN control fully clockwise, it will add around 12dB to your level. To operate the unit at around unity gain at 3-4dB of compression, set the INPUT GAIN to somewhere between "10" and "8". Important note: Since this attenuator is placed at the very input, it always affects the left and right channel even if LAT/VERT mode is engaged, because the MS encoding happens after the INPUT GAIN control. Threshold does what it says on the tin - it sets the level above which the compression will kick in. Higher number means higher threshold level, so to achieve more compression, adjust this parameter counter-clockwise. Note that to get the same levels of gain reduction, you will most likely have to adjust this parameter when changing the RATIO control. This control was not present on the front panel of the original unit. We could not think of a good reason for that, so we automated this "set and forget" feature as well. The cool thing about the ratio control on the Fairchild is also the fact that the knee of the compression characteristic gets progressively softer with lower ratios. Just what you'd wish for on a good stereo bus compressor! The numbers on the dial fit pretty well with the actual ratio of the unit - from close to 1:1 at fully counter-clockwise to 20:1 limiting at fully clockwise position. Generally, the bigger the number - the longer the release time. But as you can see, especially settings 5 an 6 are very program-dependant and could in today's popular terms be named "Auto Release" settings. Attack times seem very fast on paper, but at least to my ears, they don't sound nearly as fast as the same written settings on a VCA compressor for example. Experiment and see what combination fits your track best! Most of the time, I find this box to be surprisingly versatile for the seemingly limited choice of time constants! This is in all effect a Left-Right/Mid-Side matrix switch. To those unfamiliar with Mod/Side principle of processing, a quick explanation: This process takes the left and right channel and makes a sum and a difference of both. So the content that is "in phase" on both channels ends up in the Mid channel and what is "out of phase" ends up in Side channel. Mid channel thus usually contains everything panned to the centre - e.g. kick, bass, snare and vocals. What's left of the content - hard-panned instruments, reverbs and various spatial effects then appear on the side channel. This makes the MS processing mode especially useful for stereo image width manipulation. The LINK S. CHAIN switch either links or separates the compression control voltage (the side-chain signal) of the first and the second channel. Unless you're 106% sure that you know what and why you're doing, I would suggest the "linked" mode in stereo operation (toggle UP) and "un-linked" mode (toggle DOWN) in LAT/VERT operation. LINK CONTROLS is something that every non automated hardware owner would wish to have. This is a software link on the GUI that lets you control both hardware channels simultaneously. As with the side-chain link, you will probably have it linked for stereo operation and un-linked for LAT/VERT operation. On the drum bus, I was aiming for some added "grunt" on the kick drum and a bit more natural room reverberation. The stereo mode pulled the cymbals and space out a bit more, but the MS mode had something going on in the low end that really worked well in the mix with the upright bass. At first, I was missing the cymbals a bit but later realised that a bit less of them actually makes more space for the vocal, so I stuck with the LAT/VERT (MS) version. You would not be so keen on using the analog gear if you we not so picky about the sound to the most minute details. And when YouTube compression codec takes away a good portion of those details, a lot of us feel well... a bit sad.